Call Stack where functions, its parameters are pushed to form a Stack Frame. This stack frame is a memory location in the stack. The memory is cleared when the function returns as it is pop out of the stack. Room for Web APIs to evaluate. 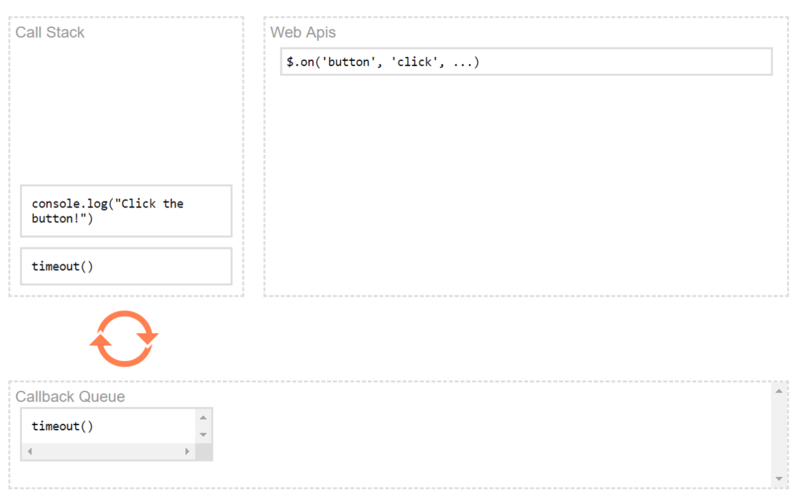 Example of Web APIs are, setTimeOut, onClick, onMouseOver etc. Queue where CallBacks are en-queued, managed and de-queued to get executed in an order. This queue is called Task Queue. There is another variance called, Job Queue which we will see later. So how does it work altogether? The Call Stack executes the items in order. One at a time, and then again, One at a time! Everything else waits in Task Queue or Job Queue until the Call Stack is free. If there is a Web API call(like, some one click on a button, or a setTimeOut has been called), it gets executed immediately outside of the stack. However, if there are Callbacks to be executed, those get placed in the Queue in the order they are supposed to be invoked. There is something called Event Loop which constantly look into the fact, if the stack is empty then, push the items from the Task Queue to the Call Stack for execution. Let's explain this with a simple Code Execution. So what is happening there? Let us see step by step. Let us assume that, the Call Stack was empty at the beginning. The function cartoon gets into the stack and it will be executed line by line. The console.log('cartoon ') pushed into the stack and executed. The next like setTimeout(tom, 5000); will be handled out side of the Call Stack as it is a Web API. It has a Callback function called tom which will be en-queued in Task Queue. Next in Call Stack is the function jerry() which get executed. And then finally the function cartoon exited. At this point, Call stack is free. Hence the Event Loop will de-queue the callback it has in Task Queue and push it to Call Stack for execution. The function tom gets executed in Stack Frame. The Call Stack is free again. That's all about it! Event Loop Model is really nothing that of so difficulty and seriousness. It is about understanding how things work in the orchestrated manner. As I mentioned before, there are different types of queues, Task Queue and Job Queue. I have generalized here as Queue. I shall be writing another post to explain the difference specifically. Hope you liked the post, Stay Tuned! Nice post ! Looking forward for the next one about queues. Thanks Jeremie Corpinot. Here you go: hashnode.com/post/task-queue-and-job-queue-..